Brad has more than 10 years of experience in electron microscopy sample prep, imaging, and user training at the UBC Bioimaging facility. He is a graduate of San Joaquin Delta College’s Biological Electron Microscopy program. 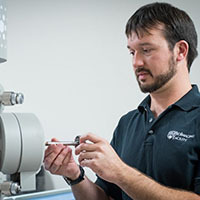 His expertise includes transmission electron microscopy (TEM), Cryo-TEM, TEM tomography, conventional and cryogenic preparation of EM samples, as well as 3D modeling using AMIRA software. He assists with many TEM and Cryo-TEM projects from across UBC, hospitals, other institutions, and industry. Some of the stories are featured on the UBC website, please visit the link (http://imaginglabs.ubc.ca/featured-projects/automotive-applications/). He also gives TEM and Cryo-TEM training to undergraduate/graduate students, visiting scientists, and industry clients.